Before Thomas the Tank Engine was a giant brand presence in the toy world, he was a simple character in a series of stories for children written by an Anglican cleric named Wilbert Vere Awdry. Reverend Awdry was born near Romney, in Hampshire, England, in 1911. His family's home was located near a main line of the Great Western Railway. That section of the railway climbed at a steep gradient and a banking engine was often needed to help heavy freight trains up the hill, usually at night. During his childhood years Awdry listened to the various sounds of the engines and their signals and imagined the different personalities of the steam engines. In 1943, Awdry wrote a story entitled The Three Railway Engines to amuse his son Christopher who was ill with measles. He build a model of Edward and some coaches and goods wagons, and created a little tank engine he called Thomas. Christopher requested more stories, and soon there were many. The Three Railway Engines was published in 1945. Thomas the Tank Engine appeared in 1946. By 1972, 26 books had been published in The Railway Series. Christopher added more stories to the series in later years. The stories were enormously popular with children for three reasons. Children easily empathized with Thomas and his relationships with other characters. Reverend Awdry's moral tales include a sweet humor that was appropriate for young children. English children were familiar with steam engines of various shapes, sizes and colors because England had a terrific rail network, employing thousands of engines. Today, due to the switch from steam to diesel and electric trains, you have to visit preserved railways to see steam engines at work in England (and almost everywhere else in the world). Toys and other merchandise based on Awdry's stories began to appear in the 1950s. 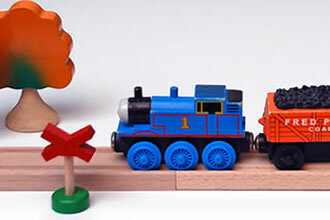 The little wooden trains we are all familiar with were first manufactured by Learning Curve Toys in 1992. The toy franchise is now owned by the giant Hasbro toy company. 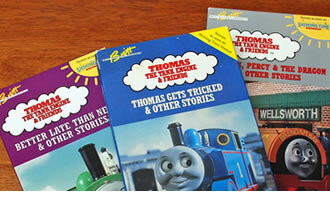 In 1983 Britt Allcroft started production on Thomas stories to appear on British television. Programs were adapted for an American audience and shown as Shining Time Station on PBS beginning in 1989. What started as an imaginative tale told by a father to his son, has grown into an enormous enterprise. You could complain about the commercialization, but the toys are wonderful playthings (especially the wooden ones) and the early books and videos have a sweet innocence and morality that still shines through. Reverend Awdry left us all quite a gift.